This offseason, MiLB.com presents Student/Athlete, a series about prospects who attended the country's best academic colleges with focus on what they learned while they were enrolled. Ask the average ballplayer to discuss economics and it'd be fairly impressive if he came up with anything more than Adam Smith's name. Kyle Hendricks, the Cubs' 2013 Minor League Pitcher of the Year, can come up with much more. In fact, he can casually provide a layperson with a comprehensive understanding of the field. And he should be able to: the 24-year-old right-hander received his bachelor's degree in economics from Dartmouth College in December, having returned to school on a catch-as-catch-can basis since turning pro in 2011. "Academics are important to me, but baseball has always been what I wanted to do," Hendricks said. "Coach [Bob Whalen] knew that, and when I got drafted, he was fully supportive. But I had to promise not only him but my mom, too, that I would come back and graduate. It was important to me, but they made me promise." Considering the demands of pro ball and the rigors of coursework at a top-tier academic institution, that wasn't an easy promise to fulfill. He picked up the credits he needed by getting back to the Hanover, N.H., campus for winter quarter in 2012 and the fall quarter in 2013. "I did feel a little pressure, trying to figure out when I could go back, when I could finish," he said. "My professors were more than willing to help me with anything I needed help with, but there was nothing I could do online or anything like that. You had to be there and involved in the classes." 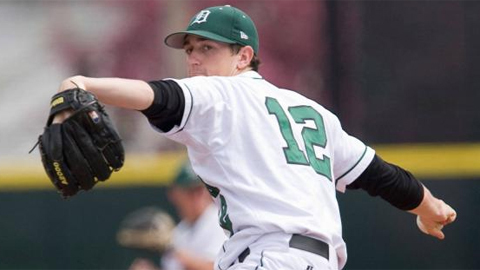 If it seems funny to imagine a guy who's being paid to play baseball stressing over term papers, Hendricks had no problem being taken seriously at Dartmouth. "People [correctly] assumed I was interested in academics and that that was important to me," he said. His teammates during his first pro assignment, at short-season Spokane, did have some fun with him. "Everybody's fresh out of college and all the talk is about where everybody went," he said. "I didn't say anything at first, but I would tell people when they ask me. There were little jokes, like about how smart I was or something. You just have to take it, though." As for that primer on economics, Dartmouth diploma in hand, Hendricks is more than happy to oblige. "It's kind of like business, but not exactly," he said. "There were a bunch of econ classes I had to take, but the core ones were microeconomics, macroeconomics and econometrics, which were statistical-based classes. "Microeconomics is all about how small businesses work, demand and supply, costs and benefits. Macroeconomics is about bigger picture stuff -- how banks work, how governments work, the IMF and how the world works with money, how money flows through the world." If all that sounds like a lot for a baseball player to take on voluntarily, it was only natural for Hendricks. Off the ballfield, education in general and math classes in particular have long been the arena in which he's thrived the most. "My parents always pushed academics on me, so I had it ingrained in me growing up that school was important," Hendricks said. "Math has always been my best subject; I didn't like English or writing papers. I'm not saying I can't do it or that I'm bad at it, but it's not really my thing and it didn't come easy for me. Math always came easy to me. I was always two years ahead in my math classes." Still, it hardly seemed like fate that Hendricks would end up at Dartmouth. In fact, he had his sights set elsewhere. "Stanford was my dream school, but it didn't work out. They didn't talk to me," he said. "But when Dartmouth talked to me, I was interested right away. I went on an official visit and I loved the campus. I had a ton of fun. It had a perfect college feel and it's in this little New England college town. "It ended up being between there and the University of San Diego. Both are good schools. USD is a better baseball school, obviously, but it was too hard to pass up an Ivy League education. It was a tough decision and to go that far from home, too. But that's the best decision I've made in my life." Before Dartmouth began recruiting him, Hendricks hadn't seriously considered going to college away from the West Coast, let alone the Ivy League. "Honestly, it was the last thing on my radar," he said. "Growing up in Southern California, my parents always stressed academics. I knew I wanted to go to a good school, but going to a good baseball school was really important to me as well." "All the credit goes to Coach Whalen," Hendricks said, "and two assistant coaches [Dartmouth had] at the time, Nicholas Enriquez and George Roig. I loved playing for those guys." That coaching staff was also at the core of a culture that encouraged student-athletes to devote as much time and energy as possible to academics. Coaches at most colleges say that school comes first, but Hendricks was familiar with horror stories in which staff members at top athletic programs expect recruits to consider their sport their only priority. "For the coaches we had, it really, really was about academics first. My school as a whole was like that. I saw a stat that said, I think it was 99.7 percent of Dartmouth's student-athletes graduate," Hendricks said. "Basically, everyone graduates. That's a testament to school as a whole and all the athletics staff. The coaches really do expect you to put academics first, and I know for sure, 100 percent, that that's true with the baseball coaches." The hurler embraced the intellectual challenges of school, focusing his major in microeconomics ("You're looking at a lot of graphs and stuff like that") and minoring in mathematics ("Microeconomics is very calculus-based, which is why I linked it to math and got the math minor"). But there were some subjects Hendricks didn't exactly love. "The thing about Dartmouth is, because it's a liberal arts school, I had to take all these other classes, too -- English and science, all that stuff. It was a struggle, but it definitely helped me out," he said. "And I'm grateful for Dartmouth making me do it because I wouldn't have chosen to do it on my own." Hendricks credits that work and the discipline required to balance being a student-athlete with helping him develop into the pro he is today. "Classes were difficult, and juggling that with athletics and academics was really tough," he said. "But Dartmouth had so many resources to help me out, and it really shaped my work ethic." And, believe it or not, Hendricks is sure the skills he honed in his microeconomics studies make him a better pitcher. "I don't think it directly correlates or anything like that -- you're not out there on the mound thinking about equations -- but it is a similar mindset," he said. "What they have in common is critical thinking. On the mound, especially at the levels I'm getting up to with good hitters, critical thinking is very important. You have to be thinking about pitch sequences and what guys are trying to do, and you watch a lot of video of these really good hitters, trying to find holes or just thinking of a different way to go after them. That's all critical thinking."